While working in Amarillo, TX, Special Agent Randall Oakes Younger was selected for an emergency assignment in Dallas. Agent Younger rode a train from Amarillo to Dallas for a full day and because of crowded conditions, had to stand the entire trip. Upon reaching Dallas, Agent Younger immediately joined other agents and traveled to Centerville in Leon County to assist in an illicit moonshine investigation. Several hours after his arrival, Agent Younger suffered a heart attack and died that same evening. His death was attributed to exhaustion in over extending himself to complete the investigation. 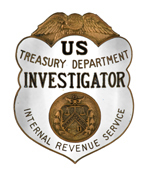 Agent Younger joined the Alcohol Tax Unit on December 16, 1940, and was assigned to offices at Gulfport and Jackson, MS; and Marathon and San Antonio, TX. He carried badge #412. Previously, he worked as an agent for nine years with the Immigration and Naturalization Service and the U.S. Customs Service. Agent Younger was born in Channing, TX. He was survived by his wife and their two children.